Johnny: (approaches Billy and Baby) Hey cous, what's she doing here? Billy: She came with me...she's with me. Baby: I carried a watermelon. Baby: (in digust) I carried a watermelon??!! While I'm not actually carrying a watermelon, it sure looks like I am. 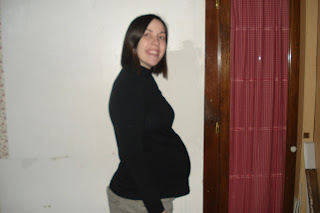 This pic is from 25 weeks and 3 days, just a few days ago. Sorry, it's blurry. I didn't notice until just now. I actually think my body's a little funny looking in this picture. Everybody keeps asking me lately how I'm feeling and, for the most part, I try to keep my answers peppy, but the truth is that my back pain is getting worse and worse. I'm having many moments of hobbling around briefly before I can get walking normally. I'm basically just trying to ignore it, but this is becoming a tougher and tougher task. It makes me feel very geriatric. In related, very exciting news....we have 100 days left until we meet our son! That's right, 180 days down and 100 days to go. I can't believe it. Loving the new layout and music from Rent. Nice job! :) Gotta love these snow days. I love that quote, I use it ALL THE TIME. Just not in a pregnancy context. :) You are looking good and congrats on 100 days to go! You look great! I can't believe only 100 days left for you!